One company develops applications to improve restaurant operations and guests’ dining experiences. Another takes organic wastes and transform them into a solution for farmers and landscapers, while another helps patients with rare or serious conditions find expert care and expert advice. These are some of the eight startups selected by a judging panel to compete in the first Alabama Launchpad Startup Competition of 2016 on Feb. 19. The free event is at Evonik Industries, 750 Lakeshore Parkway, Birmingham. Now in its 10th year, Alabama Launchpad is proud to give Alabama entrepreneurs support and an opportunity to pitch their business concepts live before the same judges in hopes of advancing to the finale event, which takes place in April. Winners ultimately will split a share of up to $250,000 funding. Through the years, it has been rewarding to meet some great Alabama startups and help propel them to further success. We look forward to future competitions. The 8 startups in this round were chosen out of 17 applications and range in stage from proof of concept to early customers. Alternavisit – Birmingham is a secure cloud based software to capture patient requests for care without a doctor’s office visit and creates an efficient solution of communication and information capture. BSRD, LLC – Huntsville works to design, build, test, and sell advanced aerospace propulsion solutions based on the enabling technology of the turbo rocket engine. Care Package – Tuscaloosa is a grocery delivery service for Tuscaloosa, with University of Alabama students as a target market, in which customers use an app for services. Daily Drip – Birmingham provides a set of components that complement a backend service to provide real-time chat to applications with fast setup. Flood-CON – Birmingham offers an automated control structure that replicates the natural runoff during all real storm events. Tech to Table – Mobile develops applications to improve restaurant operations and guests’ dining experiences. White’s Environmental Solutions – Anniston takes organic wastes and transforms them into a solution for farmers and landscapers. XpertDox, LLC – Birmingham is an online doctor finder tool personalized for patients’ diseases based on doctors’ clinical skill, educational and leadership roles and research. 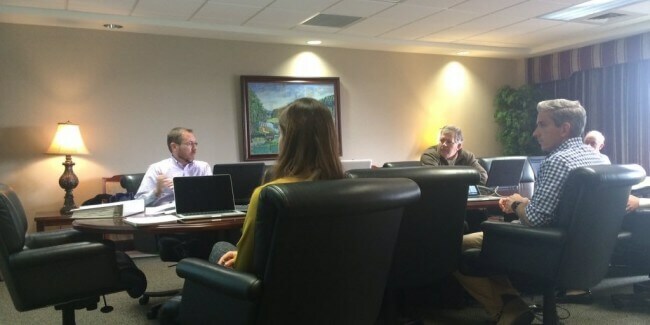 Alabama Launchpad judges meet to select the 8 startups chosen to compete on Feb. 19 in this year’s first Startup Competition.